From Geoff Herbach, the award-winning author of the hit young adult novels Stupid Fast and Nothing Special, comes a tale that will resonate with fat kids, nerds, dorks, gamers, geeks and teen outcasts of all kinds-an authentically funny story for anyone who has suffered from teasing and bullying at the hands of the high school social hierarchy. And decided to do something about it. 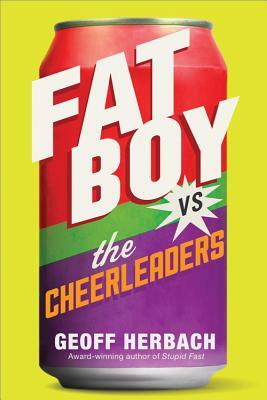 Join a cast of quirky misfits as fat boy Gabe, aka Chunk, goes up against the high school cheerleading team in a battle over control of the school's soda machine. A marching band geek who drowns his dysfunctional family woes in a voracious soda habit, Gabe relishes his role as class clown, fending off harassment from students and teachers with his own brand of irreverent, self-deprecating humor. But when the cheerleading team takes over the funds previously collected by the band, Gabe will not stand for it. Something must be done. Hilarious and poignant, Fat Boy vs. The Cheerleaders will have teen boys and girls alike cheering on this underdog turned unlikely hero. Reluctant readers and fans of Chris Crutcher, K.L. Going, and Andrew Smith's Winger will love Herbach's straightforward writing style and realism. "One of the most real, honest, and still funny male voices to come around in a while" (YALSA).